Refractory has always been an integral part of boiler design. However, because it is one of the smallest of the boiler components, it sometimes does not get the attention it deserves. Paying attention to the refractory material selection on new or existing boilers can and will help ensure efficient boiler operation and contribute to energy savings (from using less fuel) as well as preventing unnecessary steam-generation interruption. Due to the recent Environmental Protection Agency (EPA) rules regulating emission levels, it has been reported that more than 32 power plants will be closed around the United States, with possibly another 36 in the near future. Though this is a significant number, it still leaves approximately 3,100 power plants operating in the United States that burn coal, gas, oil, and other fuels, generating approximately 900,000 megawatts of electricity (excluding hydroelectric and nuclear). These boilers, by design, are typically flat studded, tangential (inner cased), or membrane-tube type boilers. Most are insulated with mineral wool board insulation meeting ASTM C-612 type IVB and require refractory to help keep them energy efficient by keeping the fire inside the boiler. 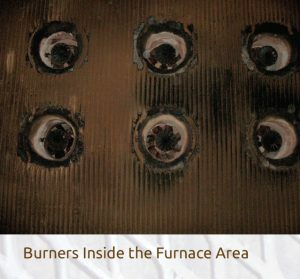 A flat-studded boiler has tube walls on approximately 6-inch centers with a 1-inch thick layer of refractory covering the outside of the boiler-furnace tubes. Tangential or inner cased boilers have even more tubes, are tangent to each other, and require only a smear coat of refractory between the tubes. A membrane boiler uses smaller diameter tubes that are shop welded together into panels with a bar between the tubes. This bar is termed “membrane” (refractory is not required between or over the membrane tubes). of the burners—all of which is created by the fuels being burned, thereby requiring a more specialty type of refractory. The term refractory in the boiler industry can refer to either a plastic or a castable-type material. According to withdrawn standard ASTM C-64, a plastic refractory is divided into 5 basic categories: high-duty fireclay, super-duty fireclay, 60% alumina, 70% alumina, and 80% alumina. A plastic material will be made from either fireclay or alumina with the balance made from other materials. The use of plastic refractory in the power industry is quite rare, since these types of products are very dense, cost more than other conventional-type refractory products, and are normally hand or pneumatically rammed. 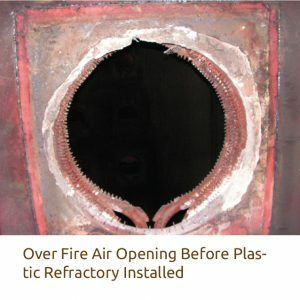 Plastic refractory tends to be used only in a specialty area of the boiler. A plastic refractory material is generally found inside the boiler furnace and is designed to resist higher temperatures and chemical or abrasive attack. According to ASTM C-64, castable or conventional refractory is divided into 2 classifications: alumina-silica-base or an insulating-type refractory. In the boiler industry, a castable refractory (alumina-silica or insulating) is more commonly used than a plastic refractory. A castable refractory is generally used for common seals, tube penetrations, and for filling wall-box applications. This type of refractory is the most commonly found refractory on all boilers; it is used on the outside of the steam-generating boilers and is not used inside the boiler/furnace area. A specialty-type refractory material also falls under ASTM C-64 and can be either a plastic or castable and covers a wide range of products and uses. Some are designed to resist thermal shock, slag resistance, erosion, or a combination of these. Unlike conventional refractory, a specialty-type product will have higher alumina content (Al2O3) or silicon carbide (SiC) as its base material, low or no calcium oxide (CaO), and have additional chemicals such as chromium oxide (Cr2O3) or zirconium (ZrO2). Specialty refractory materials are the exception and not the norm in the boiler industry. To simplify, in the boiler industry for non-specialty areas, there are 3 basic or conventional types of refractory: dense, medium, and lightweight. Dense refractory materials have a density greater than 160#/cf and are used around access doors or burner throats. Medium weight refractory materials have a density between 100#/cf to 160#/cf and are used for sealing between tubes, filling wall boxes, ash hoppers, and tube penetrations. 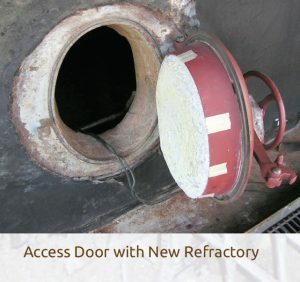 Lightweight or insulating-type refractory materials have a density less than 100#/cf and are rarely used except in access doors. All 3 types use the same common chemicals, yet each varies considerably to meet their specific use requirement. The most common chemicals for a cement bonded refractory material are: alumina (Al2O3); silica (SiO2); ferric oxide (Fe2O3), which is sometimes referred to as iron oxide; titanium oxide (TiO2); calcium oxide (CaO), which is sometimes referred to as cement or lime; magnesium oxide (MgO); and alkalies such as sodium (Na2O) and potassium (K2O). A phosphate-bonded material would have phosphorus pentoxide (P2O5) in lieu of calcium oxide (CaO). All basic or conventional refractory materials are primarily used to prevent gas and fire from escaping from the boiler furnace. Selecting a refractory type should be based on the area of usage, the temperature, and the operating conditions it will be exposed to, such as flue gas, slag, and ash (if located inside the boiler/furnace area). The aforementioned criteria should play a primary role in which material is selected, but it is also important to consider the installation of the material before the final selection is made. 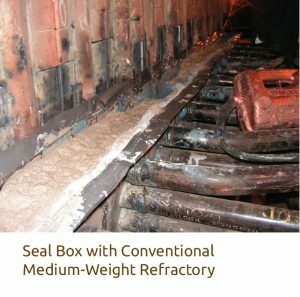 Each refractory material has unique qualities. Some refractory material can only be installed in one particular way (e.g., shotcrete, gunned, troweled, pumped, or poured). It is very important to consider all factors before you finalize your material selection. The following is an example of a power company failing to take all factors into consideration before selecting a refractory type. 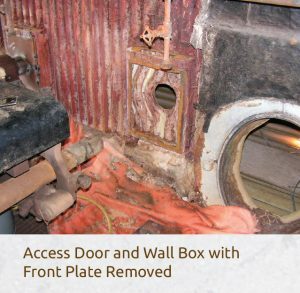 Consider the following example: Power Company “A” had 5 duplicate coal-fired boilers that are non-membrane type and require a thick layer of refractory inside the boiler on the furnace floor tubes. The plant had been using the same refractory material for many years and had reasonable success in keeping the refractory lining inside their boiler for 3 years or longer between replacements. Then, the management decided to (1) operate their boilers only during peak hours (this is called cycling); (2) ramp and cool down their boilers at an excessive ramp rates; and (3) change to a cheaper coal type or blend (i.e., 80/20 to 100%, Eastern versus Powder River Basin) to help lower their cost for generating electricity. They made these decisions without first considering the impact of the refractory material used inside their boilers and assumed that the same refractory would work fine. Cycling a boiler can cause internal stress within the refractory, which weakens the strength of the material and reduces the life expectancy of the lining. Rapid start up and shut downs can cause internal stress within the refractory, which weakens the strength of the material and reduces the life expectancy of the lining. Making a fuel change for generation cost savings without first doing a complete fuel and refractory analysis study will increase the risk of a refractory failure. The impact of these changes in operation and fuel was immediate as the refractory materials inside each of their boilers began to fail (erode or otherwise disappear). In less than 12 months, the refractory for all boiler floors were replaced using an assortment of different refractory products with each only lasting about 1 year. Then, the power company made another management decision and changed the fuel again, this time to a different coal blend. This immediately caused complete and total failure of the refractory lining in less than 1 month. Each refractory failure cost the power company more than $150,000, not including removal of any existing refractory remaining on the floor, plus the dollars associated with not generating any steam to make electricity. Choosing a refractory material at random while still cycling the boiler, and not going back to the original coal type and blend, cost the power company almost a million dollars. The fuel and generation cost savings they expected and the realities of the refractory replacement costs could impact the power plant’s very existence. Refractory has been a major contributor to boiler operation and energy savings. 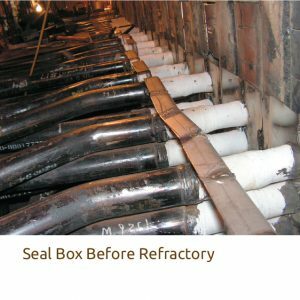 Though refractory may be one of the smallest of the components that make up a power-generation facility, it pays to pay attention to refractory. It is important to choose a refractory type based on current operating conditions. If in doubt, ask a local contractor or material supplier for assistance. Using the right refractory material to meet your boiler operation will save money and reduce maintenance costs, and will also protect the system. ASTM International, “Specification for Fireclay Brick Refractories for Heavy Duty Stationary Boiler Service” ASTM C64-72, ASTM International, (1977). F.H. Norton, Refractories (McGraw Hill Book Company, 1949).